Last Saturday involved a road trip of 226 miles. Of course I took some knitting with me. Have you ever worked out how many stitches you knit in any one session? 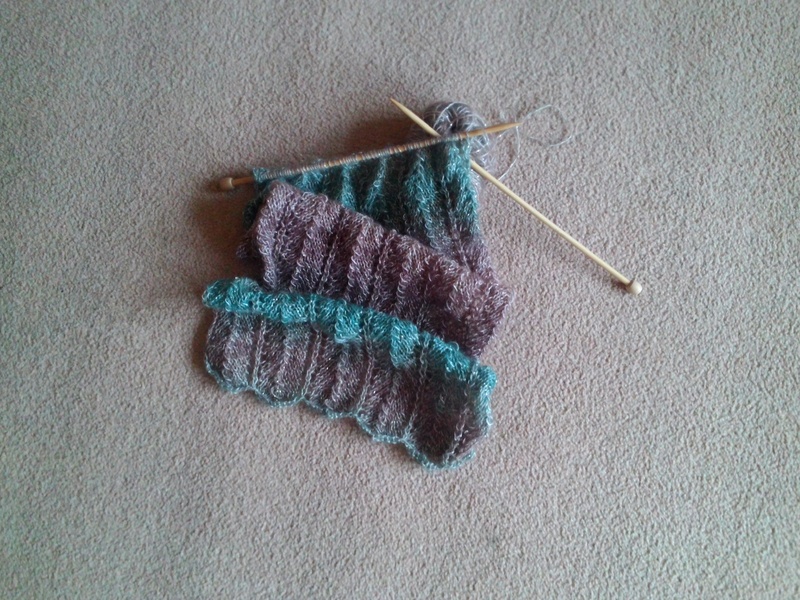 I calculated approximately 6500 and I only had a back, one front and part of another front of a baby cardigan. It’s a good job I love knitting because if I always calculated the number of stitches and hours of work it might drive me a little crazy! Then yesterday, Monday, which was a work day – was all going well until I fell down a stair (just one stair!) and wrenched my foot. I ended up at the Accident and Emergency Unit at our local hospital – knitting on and off for three and a half hours whilst being dealt with by nurse, doctor and the x-ray department – diagnosed eventually with soft tissue damage and prescribed rest and ice packs. I reckon I knitted 1499 stitches whilst I sat waiting around! Now with this now enforced r&r this cardigan will be finished super quick and if I am lucky I may even have a small pile of other projects done too. There is a bonus to injury this time, always look on the bright side of life! No camera handy to photograph those extra 1499 stitches yet. Have a good crafty day. I know I will! This entry was posted in Uncategorized and tagged craft, knit. Today we’re hitting the 30’s again and I have the sewing machine at the ready. I know many sewists have several machines, I have just one good one at the moment. What sewing machine brands do others favour? I have a fantastic Juki HZL e80 with an automatic needle threader and I never use the foot control as it has a on/off/go/stop button as an alternative. A good friend, sewing tutor, can’t get her head around the button but she likes the automatic threader – less squinting when trying to thread the thread! Sewing and knitting are definitely my kind of therapy and I just read yet again another article on the internet that someone new has just come to realise it too! For once in my life I am feeling slightly on trend. This week has been a little stressful, with a family funeral, the build up to it, the coming down after it. When time was free I picked up the knitting needles or fabric stash and set to. I can’t say I tidied up after myself, much to the chagrin of husband and son – but decided it was the creating I needed. I am wondering how long I can wing that one! I always say life is too short to do more than the minimum housework. Wishing you all a good day/weekend/crafting session. This entry was posted in Uncategorized and tagged doughnuts, Juki, knit, positive, sew, sewist, stocking stitch, Teashop, therapy.